This is the last of the Sunday Long Runs for the first half of 2010! This week we’ll be running the route for week 14 of the Boston Training, giving Dan one last run through the hills before Vermont. In order to get to the Brunch on time some runners plan on starting a bit early. The idea is to finish the 12.5 mile route by 10 so we can get over to Liz’s before all the good food is gone. For some that means taking off from Brueggers at 7:30, for others 7:45, and some will leave at the normal 8AM. So let me know if you’re running and what time so your pack can arrange to take off together. Personally, I’m planning on 7:45. Water stop… someone needs to get some supplies out to Highland Ave. I believe Barry has some supplies, as do I. Let me know who’s interested in being the stop and who can pick them up and I’ll drop some stuff at one of those people’s houses on Saturday. As far as the Brunch goes, it’s at Liz’s house. I’ll e-mail the address to people later today. If you don’t think I have your e-mail, e-mail me today at jimcarson@melroserunningclub.com. Who’s in? And who else is coming from Brunch. If you ran at least one run with us you’re welcome to join in on the celebration. So far I have the following: BarryC, LaurenC, Catherine, Nancy, Genevieve, Ginny, Sue, DaveH, Michelle, Carol,, Judi, Lois, Liz, Jim, Dan. Who’s up for Dan’s Taper Run? 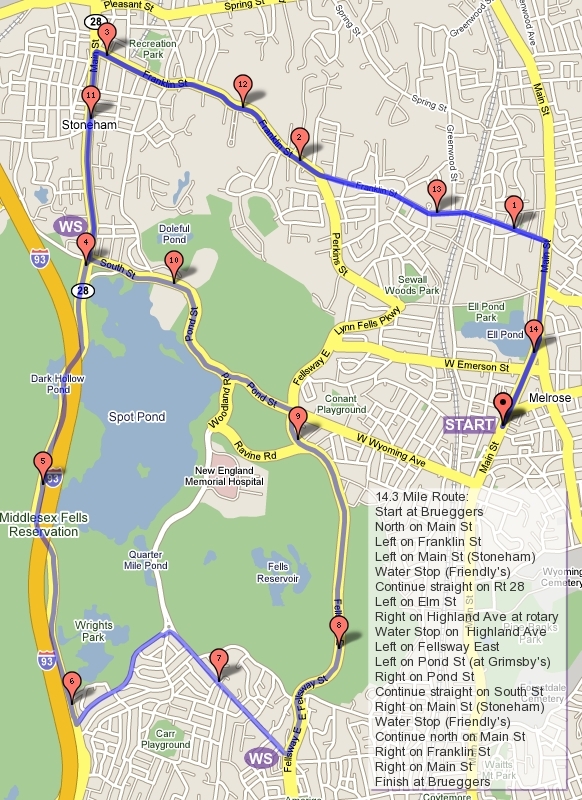 He’ll be doing 14.5 and it looks like he’s planning to run the same route we ran last week… although I had suggested Horn Pond. There’s a chance I won’t be around to join in (but I don’t really know what I’m doing until I’m actually doing it these days) so I’ll leave the planning up to you guys. Post your interest , coordinate a water stop or two, and get Dan one week closer to Vermont City! With Dan’s 22 mile training run is in the books! A wet, windy run complete with thunder and lightning brought Dan’s training to a crescendo, and now with taper runs planned for the next two weeks its time to plan the end of the season brunch! The current thought is a late morning brunch on Sunday, May 23rd. Liz has offered to host and we’re thinking of starting around 10AM, that way those that want to get a run in beforehand can. Anyone that participated in any of the runs is welcome so spread the word! Bring a dish and your race stories, Liz will be setting up a Bloody Mary bar, and let’s toast another successful season of training while sending our last marathoner off. Due to Mother’s Day and the Melrose Run for Women on Sunday, this week we’ll meet on Saturday for the long run. We have Dan’s loooooong run this week, 22 miles and then our last marathoner of the season can start tapering. The plan at the moment is to have Dan park out on the route 3.5 miles away from Brueggers as a water stop, run back to Brueggers to meet us, run a 15 mile route, then Dan will finish up with a run back to his car. 3.5+15+3.5 = 22! I’ll be running this week but I have to be home by 10:30 so I’ll only be doing the 15. Who else is interested in helping Dan through his last long training run? I think I’ll need one more water stop volunteer as well. Who’s in and for how much? I’ll figure out the route once I get some feedback.